Posted by Mastura Zaini-Roberts on Monday, April 1st, 2019 at 9:56am. A vast majority of today’s consumers believe that selling real estate is an easy business. Many believe sites like Zillow provide all the information they need to locate the right house and close the transaction. Sadly, both groups are seriously mistaken. The reality TV shows have glamorized the business of showing properties and writing offers without showing the behind-the-scenes work it takes to close a transaction. Many of the technology companies promote the belief that an algorithm is the only thing needed to help a consumer locate and then close on a property. The industry as a whole has done a poor job in communicating all the steps required to close a transaction. If locating a property online is so easy, how come 52 percent of buyers named finding the right property as the most important reason they work with an agent? 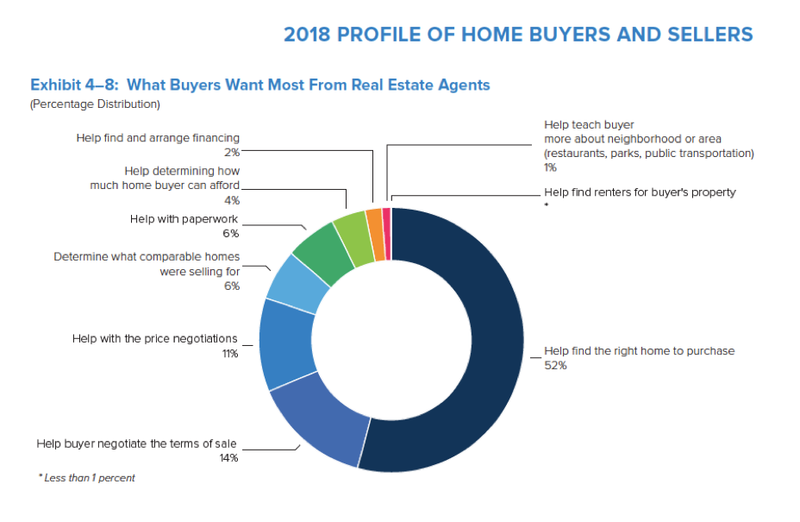 Next in importance was helping buyers with price negotiations (11 percent), and third was handling the paperwork (6 percent). The truth of the matter is that agents earn their commissions at the negotiating table, overcoming transaction problems and coordinating all the service providers required to reach the closing table. The next time someone asks you to reduce your commission or says, “I can get my house sold cheaper on the web,” use the list below as a reminder that locating the right house is merely the first step in a very complex closing process. The hardest work starts once the property is placed under contract. Below you will find just a few of the many tasks agents complete on behalf of their clients. Expand the suggestions below by adding the additional details about what it takes to close a transaction in your area. When a client tells you that all you had to do to close the transaction was to put a sign in the front yard, you can share your list that shows everything required to close a transaction in your area. Flood zones, which often require owners to obtain special insurance. Foreign Investment in Real Property Tax Act (FIRPTA). The proper delivery and execution of the agency documentation. Environmental hazards disclosure including asbestos, radon and other dangerous substances. In brush or other high-risk areas where standard homeowner insurance policies are not available, the agents must coordinate the buyer’s application for the transference of a California “Fair Plan” insurance policy or the issuance of a new policy. “Special Studies Zone” disclosure for active earthquake faults. “Mello Roos” disclosure (used to raise taxes to fund community facilities). Installation of automatic gas turnoff for earthquakes. Installation of low-flow toilets and shower heads. Smoke and carbon monoxide detectors. Here are just a few of the many challenges real estate agents face and overcome on a daily basis, none of which can be solved by an algorithm. Does the seller have a prepayment penalty, and if so, who is responsible for paying it? What happens if the buyer can’t obtain a fixed-rate loan as per the contract? What happens if the appraisal comes in at less than the sales price? What happens when the buyer gets cold feet and uses an interest rate increase as a legitimate reason for cancelling the transaction? What happens when the buyer doesn’t qualify? Inspections are one of the most important areas where agents earn their commissions. For example, how are incorrect findings by inspectors handled? How are legitimate differences in property condition resolved between professionals such as geologists and roofer? After three other inspectors plus numerous discussions with the HOA, we finally discovered there wasn’t a termite problem after all — what the inspectors were seeing were simply some dead beetles. The existing wood damage occurred a year earlier prior to the last treatment for termites. The point here is a savvy agent can save both parties time and money as well as protect them from unscrupulous inspection services. In addition to the tasks above, agents must coordinate the title services, escrow, attorneys and a host of other service providers. If your company provides a moving services bureau or “concierge” services that assist buyers with change of address, movers, repair people and the like, this adds another layer to the list of the services you provide to earn your commission. In addition to coordinating all the aspects of the transactions, when disputes arise, the agent is usually the first line of defense for their principal. Agents know how to work around appraisal problems, title issues, differences in opinion as to who is responsible for repairs, etc. In fact, in my experience, up to 95 percent of all transactions have problems severe enough that the parties believe the transaction won’t close. Ninety percent do close with less than 1 percent with litigation — why? Because the agents involved successfully negotiated the dispute to the parties’ satisfaction. The best way to present this material is to place it in a checklist format that shows each document, each disclosure and each step you are required to take to close a transaction. If you’re like most places in the country, the list can easily be up to 100 steps or more. The next time someone thinks your commission is too high, remember, it’s your ability to navigate through these various aspects of the transaction that makes your clients’ goal of selling or buying a piece of property become a reality. With more than 1,000 Inman posts, Bernice Ross is a long-time contributor whose weekly column on real estate trends, luxury, marketing and other best practices publishes every Monday. Las Vegas Among Top 8 Cities for People Who Hate to Pay Taxes! What does a real estate agent do all day anyway?